As with all Epiphone instruments, the PR-5E features a Limited Lifetime Warranty backed by Gibson's 24/7/365 Customer Service. The eSonic system features Shadow's extended 5-year warranty giving you added peace of mind. Play the legend, join the club, and get yourself a PR-5E today! The PR-5E features a premium select spruce top with a hand-scalloped, proprietary X-bracing pattern. Combined with the slightly arched mahogany back and mahogany sides, the PR-5E provides a sweet tone that projects well even when unplugged. The select mahogany neck has a 25.5” scale and the SlimTaper™ profile makes the PR-5E easy and comfortable to play long gigs and rehearsals. Now With The Revolutionary eSonic System! Recently updated with Epiphone's new, eSonic™ preamp and NanoFlex™ pickup system, the PR-5E comes alive when plugged in. 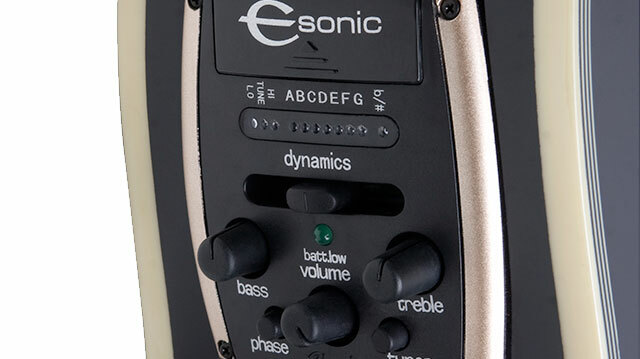 Made in cooperation with Shadow Germany, the new eSonic preamp features a built-in, easy-to-use tuner. When engaged, the guitar's output is automatically muted with no "popping" noise, making it a perfect choice for stage use. You can even push in the "tuner" button and unplug the guitar without a loud "pop." 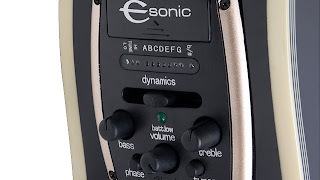 Other controls on this state-of-the-art preamp include Master Volume, Bass, Treble, EQ Shape, Low Battery indicator and a Phase switch to help eliminate unwanted feedback. The preamp uses two 2032 lithium watch batteries that are not only lightweight, but provide significantly longer life than old-fashioned, heavy 9V batteries. Under the PR-5E's compensated saddle, is Shadow's proprietary NanoFlex™, low-impedance pickup. Unlike a piezo, this unique flexible sensing material features integrated active electronics and picks up not only string vibration but also top and body vibrations as well for a truly acoustic tone without the harshness of piezos.